# Grate the onion on the crumbs. Mix, when it turns to puree, add the remaining meatball ingredients, and knead for about 8-10 minutes. # While refrigerating the meatballs mix, peel the potatoes, and slice them into 1/2 inch wide circles, slice the tomatoes also, and slit the each pepper into 2 pieces and remove the seeds. # Grease the oven tray with 1/3 cup oil. Place the potato slices on the tray. Place the big sized meatballs on the potato layer with spaces between them. 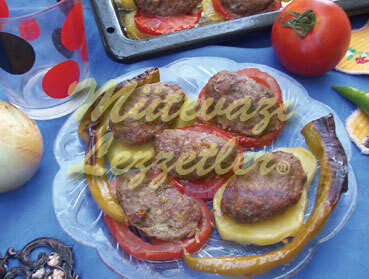 # Place the tomato slices and pepper slices into the spaces between the meatballs. Sprinkle salt all over. # Cook it in the oven which is preheated to 374 F, until the meatballs turns to red. Serve hot. Note: It is advised to lay the meatballs mix all over the potato layer instead of shaping them.